Most of my travel destinations are dictated by work or family commitments. The beer excursions that you read about on the pages of this blog must be creatively worked into the itinerary of those trips. This explains why my first report from Europe since starting this blog is not from Brussels or Munich, but from Helsinki. How you may ask did I end up in Finland in late November when the temperature hovers around freezing and the days are only marginally longer than a college football game. To answer that question I need to take a brief detour to explain an unusual feature of the Finnish academic system. Although Finns are not particularly formal about many societal customs the same cannot be said for the process one must go through to get a doctorate. The final step is to invite a professor from outside the university to come in and grill the aspiring doctoral candidate in a public defense that takes place in front of his or her parents, siblings, labmates, and other curious onlookers. I was invited to play the role of opponent for the dissertation defense of Sami Vasala, a clever young chemist at the University of Aalto which is located in Espoo a western suburb of Helsinki. Playing the role of opponent is not an easy job. The exam lasts for 2-3 hours and during most of that time Sami and I sit at tables that face each other and engage in a debate over the contents of the dissertation. It’s important that the opponents questions be at the right level of difficulty. If they are too easy people start to wonder why they paid to fly in this “expert” from across the Atlantic. If they are too hard the outcome is probably even worse. Lord knows I didn’t want to end up facing an angry family member in a dark alley staring down the wrong side of a frozen herring. Fortunately, Sami was well up to the task and everything went smoothly. Afterwards there was a formal dinner held downtown, which much to my delight involved delicious food, plenty of wine, and no internal organs of a reindeer. Sahti is the only primitive beer to survive in Western Europe. The beer that peasants learned to brew in the 1500s is still made much the same way today, much of it in people’s homes. Many sahti brewers of today use woodfire-heated kettles from their cow houses and saunas as mash tuns. Fresh juniper twigs are used in the filter bed on the bottom of the lauter tun and also used to infuse the hot brewing water. It is a sweet, malty, turbid beer with complex flavor, the banana-like notes and phenolic peaks found in a German Weizen intermingling with juniper. The alcohol content varies from 7 to 11 percent. If you are interested in more details about how Sahti is made I suggest you check out a well written post (with a lot of good pictures) entitled “Sahti – The Finnish Farmhouse Ale” that I found on a Finnish blog site. It’s a good read for the homebrewers out there, but for everyone else I will summarize here. Sahti is made with various grains in addition to malted barley, including oats and rye. Hops can be used sparingly but are not required. The mash is filtered through juniper twigs and then the wort goes straight to fermentation with no hop boil. Taking yet another turn away from conventional brewing Finnish baker’s yeast is used for the fermentation in place of standard ale or lager yeast. It’s an antiquated way of making beer that has been handed down for at least 500 years and probably much longer. More popular among homebrewers than commercial breweries, think of it like the moonshine of Finland in beer form. Suffice to say I’ve never come across a bottle of Sahti in the states, although some American breweries have on occasion tried their hand at variations of this style. The one that seems to have the widest distribution is a Dogfish Head beer from their ancient ales line called Sah’tea. For those of you living in Oregon, the Ale Apothecary, located outside of Bend, makes what is the highest rated Sahti on either of the big beer rating sites. Although like all Ale Apothecary beers the distribution is likely to be limited and the cost high. While I’ll admit to being a little obsessed with beer, I do save a small part of my brain and time for other activities, so I thought I should at least spend a little time looking around Helsinki, before I started seriously tracking beers. Although as you’ll see my sightseeing excursion ended up leading me to a brewery. Armed with a city map not much bigger than a postcard and some scant internet research on things to see and do, I set off on Saturday about midday to explore the capital. The season’s first snow had fallen the day before and the city looked quite festive in a fresh coat of white. The forecast was for partly cloudy skies with a high temperature of −1 °C (30 °F). I spent five nights in Helsinki and this was the only day that I was fortunate enough to glimpse the blue of the sky, not the sun itself mind you, but at least some hints of blue as you can see in the picture below. Partly cloudy may not seem like an inviting forecast, but in southern Finland at this time of year it’s an excuse to break out the cross country skis and pack a picnic lunch. 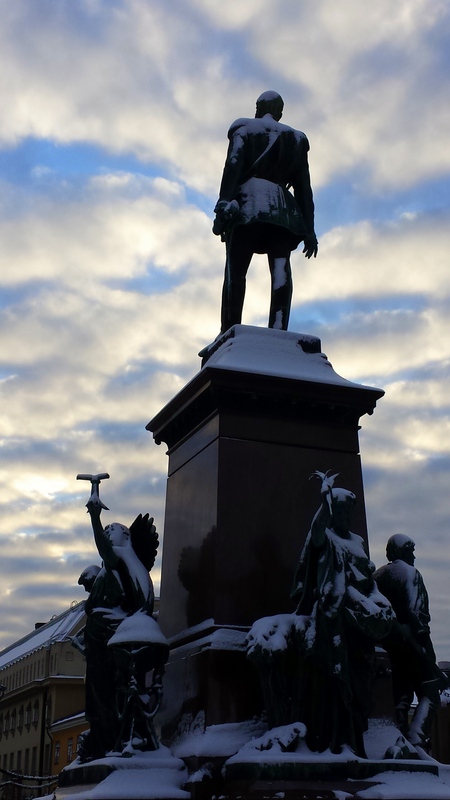 The statue of Alexander II located in front of Helsinki cathedral. The first (and only non-beer related) order of business was to visit the sea fortress of Suomenlinna. 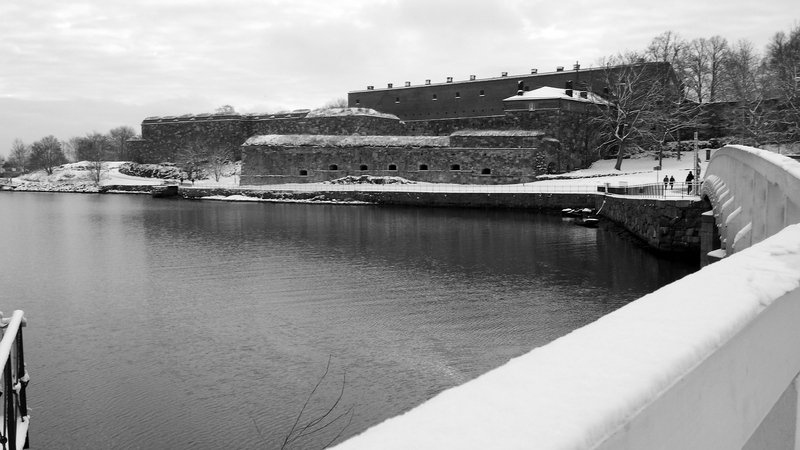 Established in 1748 as a military outpost and naval base by the Swedes, who ruled Finland from the 12th century until 1809, Suomenlinna is a fortress built on six closely spaced islands that lie in the Gulf of Finland and strategically guard Helsinki’s harbor. You can reach Suomenlinna by a ferry boat that takes 15-20 minutes and costs 5 Euros for a return ticket. The ferries depart every 40 minutes from market square on the harbor. On the day I visited it was not particularly crowded which made for a peaceful setting. I spent most of my time wandering through the courtyards of the old palace and walking the battlements that overlook the Bay of Finland. The freshly fallen blanket of snow and the half-light of a winter day made for a very peaceful, winter holiday vibe. I could imagine myself transported back to Victorian times, a feeling that was heightened by the complete lack of cell phone and internet connectivity. There was even enough of a break in the clouds to perceive the sunset over the Baltic sea. If you ever go to Helsinki Suomenlinna is a must see destination. Apparently in the summer it is a very festive and popular location for locals and tourists alike. A view across one of the bridges that connects the islands of Suomenlinna. After an hour or so of wandering around the islands I made my way back toward the main quay to catch the ferry. Even though it was just past 4 pm the sun had set nearly 30 minutes ago and the long Finnish night had descended. I could see the ferry approaching the dock, but just then I spied a sign for a brewery in the row of buildings that face the quay. So I decided to sample their wares and wait for the next ferry. The inside of the Suomenlinna brewery/restaurant is a simple, rustic setting similar to the other buildings on the islands. I later learned this building was built by the Russians, who controlled Finland from 1809 to 1919, as a barracks for the Czar’s troops. The main public area is a long room with wooden plank floors and plain white walls. Half of the room was set up as a restaurant with places set for people that would presumably arrive later in the evening for dinner. The other half held a bar that was cluttered with all manner of things and 6-7 tables, all of which were full when I arrived. Each table had a burning candle and some operatic Christmas music was playing in the background. They were pouring three house beers—a pilsner, an American pale ale, and a dark ale with spices, called Old Grieg. Given the weather and the setting how could I order anything other than a pint of the Old Grieg. It’s a good representation of the winter warmer style—dark amber in color, malty without being too sweet, and spiced with cardamom and other spices I couldn’t pick out. After a while the next ferry pulled in and the place filled up with patrons again. Warmed by the pint of hearty beer (7.4% abv) I headed back into the night to catch the ferry back to the mainland. Since Sahti is Finland’s major contribution to the brewing world you’d think it would be everywhere, or at least one could find it at the better beer bars in the city, but you’d be wrong. What you can find without looking too hard are pale European lagers that will set you back on the order of 6-8 Euros ($7-$10) per pint. Fortunately, I mentioned my quest to my host at dinner on Thursday night and she was kind enough to supply me with a bottle of Sahti as a gift the next day. She told me that the place to find it is at the state run Alko liquor store. That didn’t stop me from hitting several pubs in search of Sahti, but it was only on the third day of searching that I found a place that serves Sahti, St. Urho’s Pub (more details toward the end of the post). How many beers have you tried that feature a reindeer on the label? The bottle of Sahti that I was gifted is brewed by Finlandia brewery, which is a small brewery located in Forssa a town that is 115 km northwest of Helsinki. It comes in a plastic bottle with a screw top lid and a crooked label. Not exactly the cage and cork sophistication you get from many Belgian farmhouse ales. The beer itself is a deep brown color with absolutely no carbonation. I can’t recall pouring a beer that was this flat. It’s quite aromatic though, with a distinct banana aroma that is reminiscent of a German Hefeweizen or Dunkelweizen, and some spicy, herbal aromas that are hard to describe. Some clove-like phenols are definitely present, but there are also herbal notes that I assume come from the juniper. To the taste it’s sweet and syrupy with a big helping of bready, caramel maltiness and a healthy dose of the bananas that were so evident on the nose. They do use baker’s yeast to brew Sahti, and the end result is a little like a glass of spiced banana bread. The thick, syrupy mouthfeel is accentuated by the complete lack of carbonation. I start to understand why Sahti is hard to come by, even in Finland. It’s definitely an acquired taste. After half a glass I’m not sure I will be able to finish the bottle, but I manage to do so over two evenings. The more I drink the more the distinctive flavor grows on me. I would definitely try it again but the sweetness and complete lack of carbonation are such that I doubt I would ever want to drink it on a regular basis. I suppose one could think of Sahti as a distant unrefined cousin of Dunkelweizen. It’s interesting that the baker’s yeast produce esters and phenols that are reminiscent of weizen yeast. According to an article from the magazine Brewing Techniques, it’s important to use the right strains of baker’s yeast from Finland. That pack of Fleischman’s yeast sitting in your kitchen will not produce the same flavor profile. 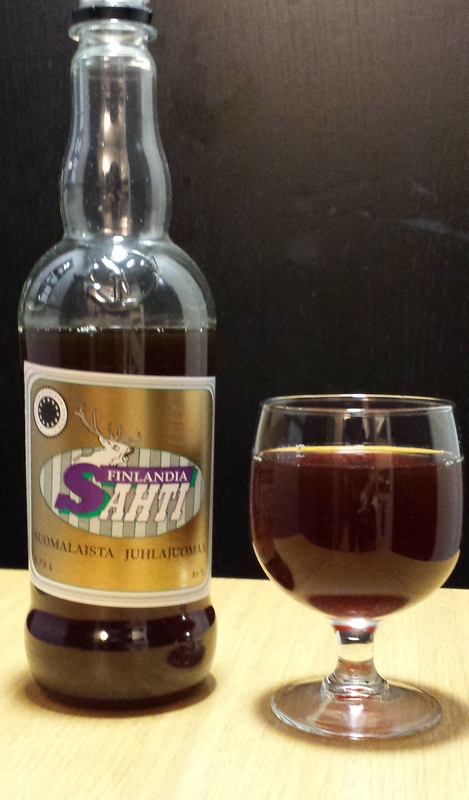 Lest you think that I got a bad bottle or my ability to describe the taste and smell of Sahti is inadequate, both of which are possible, Michael Jackson posted the following brief notes about Finlandia Sahti—muddy, syrupy with a good juniper character. 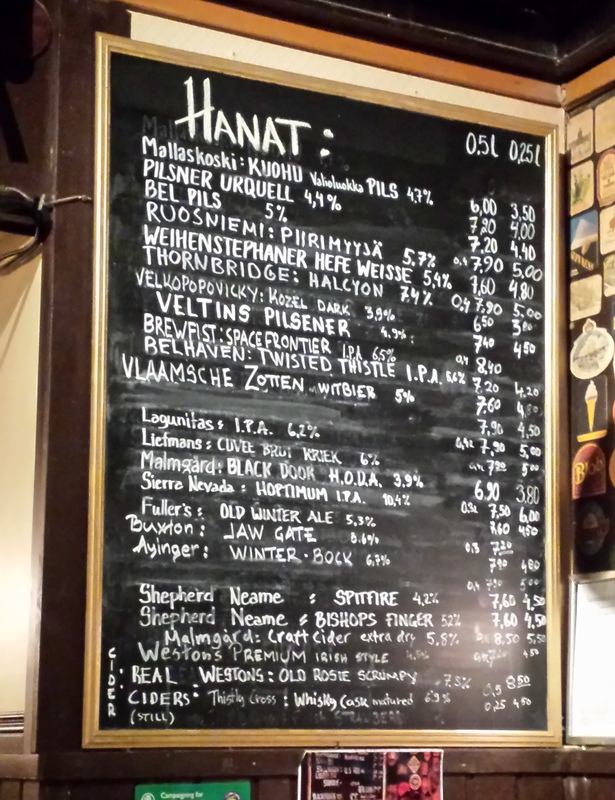 While my Sahti quest didn’t quite live up to expectations, I did enjoy visiting several pubs in Helsinki where I was able to try several great beers. To finish this post (pun intended) let me share some notes on the pubs that I visited while wandering the city in search of good beer. Located not too far from the main railway station, Kaisla is quite large yet is designed in a way that maintains the feel of an inviting neighborhood pub. There is a bar in front that was pouring a dozen beers and another bar in the back that for whatever reason I didn’t check out very closely. The draft list at the front bar was not spectacular, with taps pouring widely available non-Finnish beers like Kronenbourg 1664, Palm, Murphy’s Irish Stout, Fuller’s London Pride as well as a variety of German ales, and a few taps set aside for Finnish ales. I ask the bartender for a recommendation on a Finnish beer and she steers me to Keisari 66, a Finnish brewed American Pale Ale. It’s a decent beer but doesn’t make much of an impression on me. Where Kaisla shines is in the bottle selection. There are two coolers adjacent to the bar, situated in such a way that you can walk up to them and peruse the selection. The Belgian selection is particularly impressive, featuring beers from six different Trappist breweries, Saison Dupont, La Chouffe, Tripel Karmeleit, Boon Marriage Parfait and many more. Much to my delight I find both Cantillon Gueuze and Kriek. These are beers I’ve long wanted to try but are very difficult to track down in the US. 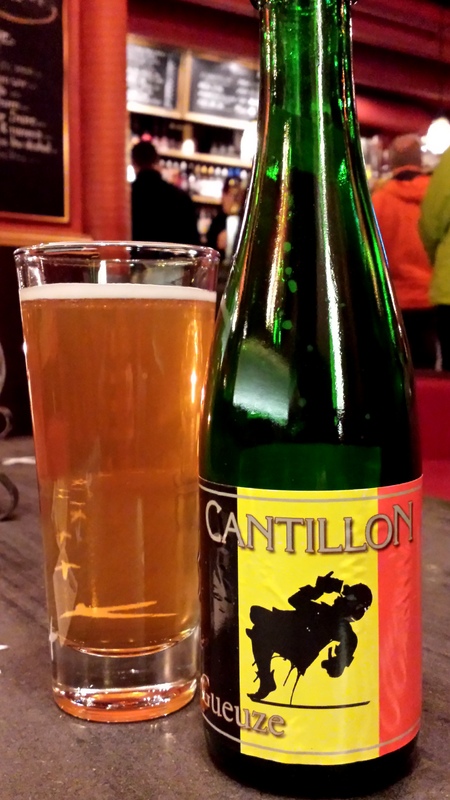 So I order a bottle of Cantillon Gueuze and find a comfy spot on a couch to enjoy my good fortune. Suffice to say I was not disappointed. I was expecting something that was over the top sour, but instead I found it to be very lemony with just the right amount of barnyard accents, and supremely drinkable. 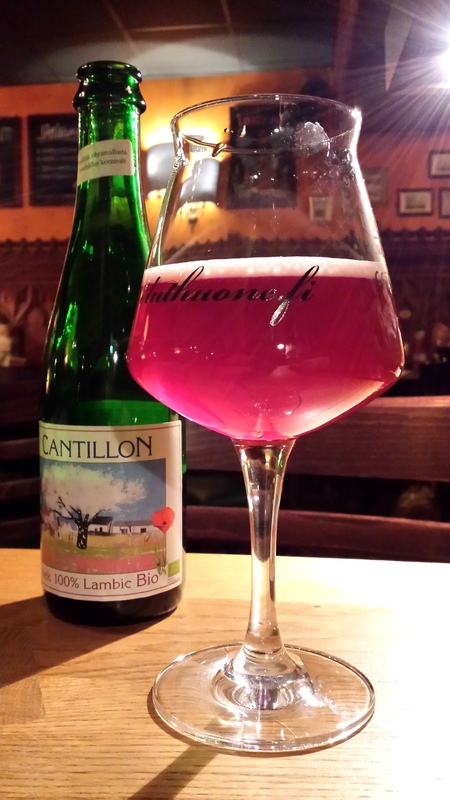 I enjoyed my first visit to Kaisla so much that I returned for a second visit on Sunday so I could try the Cantillon Kriek. On this trip I sat in the middle room where many of the patrons were playing games. At one table four college age men were playing Cards Against Humanity, while in the far corner of the room a group of 8-9 people were playing Trivial Pursuit. At yet another table a half dozen people were playing a game that involved a laptop and dice with varying number of sides, perhaps Dungeons and Dragons although no one appeared to be drinking mead. Once again it was a very inviting, comfortable atmosphere in which to enjoy a few gems from their bottle list. The Kriek was also a treat, but between the two I had a slight preference for the gueuze. Located southeast of the Railway station, it takes about 15 minutes to walk from Kaisla to the Black Door Pub (unless you get lost like I did). It has a real English pub feel—lots of dark wood, stools at the bar, an ample selection of Scotch whisky, English football on the tele, and a handpump serving real ale from a cask. Authentic English ale on cask is hard to find in the states, so I take a seat at the bar and without hesitation order a half-pint of Whitstable Bay Pale Ale. It’s a nice departure from what I normally drink, but I’m not blown away. When it comes time to order a second round I ask the bartender for his recommendation of a good Finnish beer. The bartenders here, both big burly guys with shaved heads and Duvel shirts, look intimidating but are actually friendlier and more knowledgeable than the ones I interacted with at Kaisla. He tells me they are pouring a very hoppy beer made special for this pub. Curious to find out what a Finn considers a very hoppy beer I order a pint of H.O.D.A. (hop overdose ale) by Malmgård brewery. After only one drink I agree, this beer would be considered hoppy in any country. It doesn’t have much malt backbone and consequently while the hops are unmistakably citrusy they are also a bit astringent. When the bartender sees me taking notes he tells me that it is 3.9% abv and 120 IBU! No wonder it lacks balance. Still as the only truly hoppy beer (at least in the US craft beer sense of the word) I tried on the trip it was a good wake up call for my palate. I settle in to watch second half of the Manchester United v Arsenal football match and nurse my glass of overhopped session ale. Check out the prices and selection of ales at the Black Door. The third Finnish pub I visited, St. Urho’s Pub, was not part of my weekend excursions, but rather the venue where Sami and I had dinner on the Monday night before I left town. Once again the vibe here is very much in the style of the pubs I’ve visited in England. Unlike the Kaisla and Black Door, this pub is located adjacent to a restaurant and offers a pretty solid selection of food ranging from burgers to reindeer steak to fish and chips. The décor here is heavy on the dark wood with a well-worn comfortable pub feel. For a Monday night they attract a decent crowd. Like Kaisla, they have Cantillon bottles for sale and like Black Door they are pouring real ale from a beer engine. Unlike the other two pubs it is also possible to get Sahti here. At this point I had already finished the bottle of Sahti that I was given and not particularly anxious to try another, but Sami who is Finnish and has never tried Sahti decides to give it a try. The bartender disappears into the walk-in cooler and emerges with a chalice of Sahti. Sami’s reaction to Sahti is similar to mine. I guess I saved the best for last, because the beers at St. Urho’s were arguably the highlight of the trip. The first was a Finnish porter called Huvila that was recommended by the bartender. This was the best Finnish beer of the trip I tried, a big 7.4% abv porter that is bursting with chocolate and coffee flavors from the malts, yet manages to keep a dry finish. It reminded me very much of Founder’s Porter, which I consider to be one of the best porters on the planet. For my next pint I decide to give real ale another chance and order a pint of the Fuller’s ESB on cask. It’s so floral and fruity, but at the same time sessionable and delicate. Very impressive, better than the Whitstable Bay, and unlike any beer that you can find in Columbus (including Fuller’s ESB in the bottle). To end the night I thought it would be appropriate to try a Baltic Porter, a style that may not be synonymous with Finland but is certainly linked with the region. 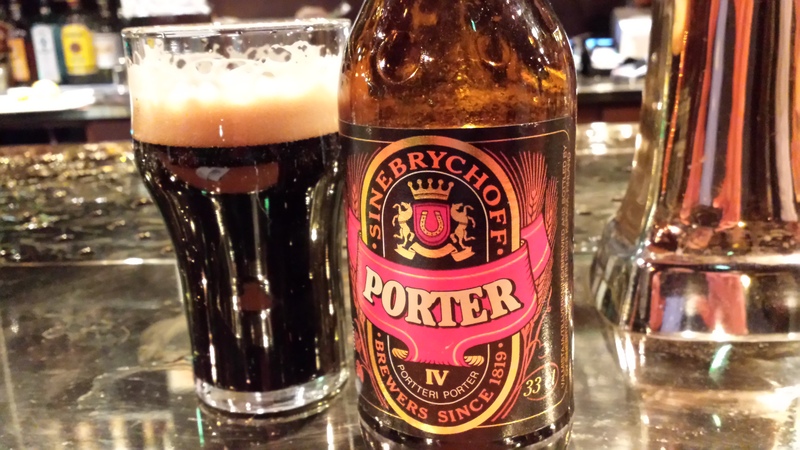 I opted for a bottle of Sinebrychoff Porter, a beer that is much praised in Michael Jackson’s writings on Finnish beer. A bit sweeter than the Huvila, it is also a big flavorful porter that hit the spot and left me with some fond memories of my time in Helsinki. Though if I were to have a fourth glass I would go back to the Huvila. Sinebrychoff’s classic take on the Baltic porter style. Just as a heads up: the “Huvila”-series of beers are also brewed by Malmgård. Great post. I was born in Finland and have been there 20+ times but unfortunately have only had their Euro lagers, since that is what is typically available at most bars/restaurants. This summer I’ll have to check out St. Urho’s Pub to check out those Porters and give Sahti a try! It must be a very nice place to visit in the summer. Good luck hunting beer on your next visit.